I am the proud mother of two mastiffs that work with me in a long term care facility for ventilator-dependent patients. Oscar has shown affinity to work with patients that have come to us with devastating head injuries. Many of these individuals are in a vegetative state. 10 months ago, we received a young man who had been the victim of a violent mugging that left him neurologically devastated. It was so sad and his parents were going through the stages of mourning. It was hard to be objective and make it out of that room without tears. When I work, I bring Oscar one day and Ali the next, so they take turns. The second day this young man was in the facility, Oscar came to work. His routine is always the same. He goes through the door to the unit and begins checking each room and each patient. 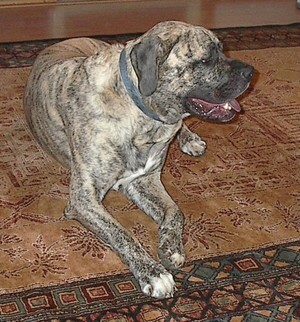 Everyone refers to them as “mastiff rounds”. This time, when he came to this young man, he stopped. He put his foot on the side rail and looked to me to lower it. I lowered the rail and Oscar put his face next to this young man’s face. Although Oscar checked on his other patients throughout the shift, he kept returning to the bedside to lay his head next to Ron’s (not his real name). He had not done this before, but I didn’t question what the dogs do with the patients, since they seem to know intuitively what each patient needs. This routine continued each time Oscar came to work for about 3 months. Ron learned to walk with assistance, using aids began to feed himself, and as long as Oscar was there to cheer him on, he slowly learned to perform activities of daily living. To make a long story short, he walked out to the car today and went home with his parents. He still has many challenges, but I have no doubt he will make it. Oh, yes, he is going home to a mastiff puppy named Oscar. So tonight, when you have a conversation with God, mention Ron, and ask God to watch over him. It was difficult to say goodbye, but I know little Oscar will take good care of him. I just thought you all might enjoy another account of the way our babies serve humankind. I have gotten these two in touch with one another. Stay tuned for more about Toni, Nikki, Ron and Oscar!!! I am very interested in the story of Ron and Oscar. Any chance of talking to Toni Leah Bush with a veiw to writing the story in our magazine, ' The Dog Collection.' This request is urgent as the copy out date is next week!